If there is one family online who lives and breathes Montessori in their daily life it’s Nicole’s family. 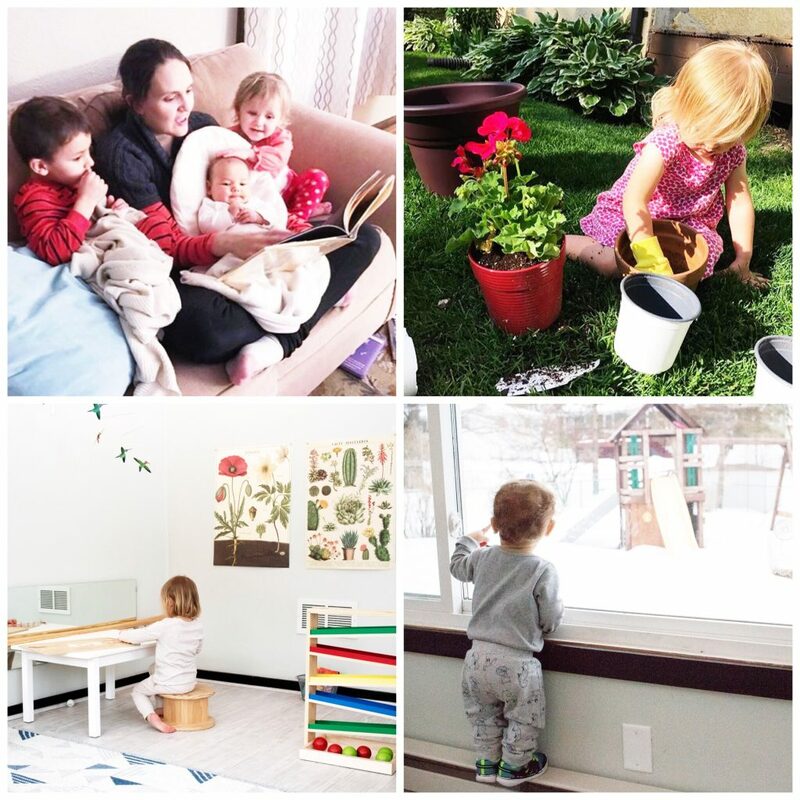 Nicole shares her Montessori experience with her three children (and dog!) over at her blog The Kavanaugh Report and is active on Instagram here. Both are full of inspiration for including Montessori every day. Hi everyone, I’m Nicole! 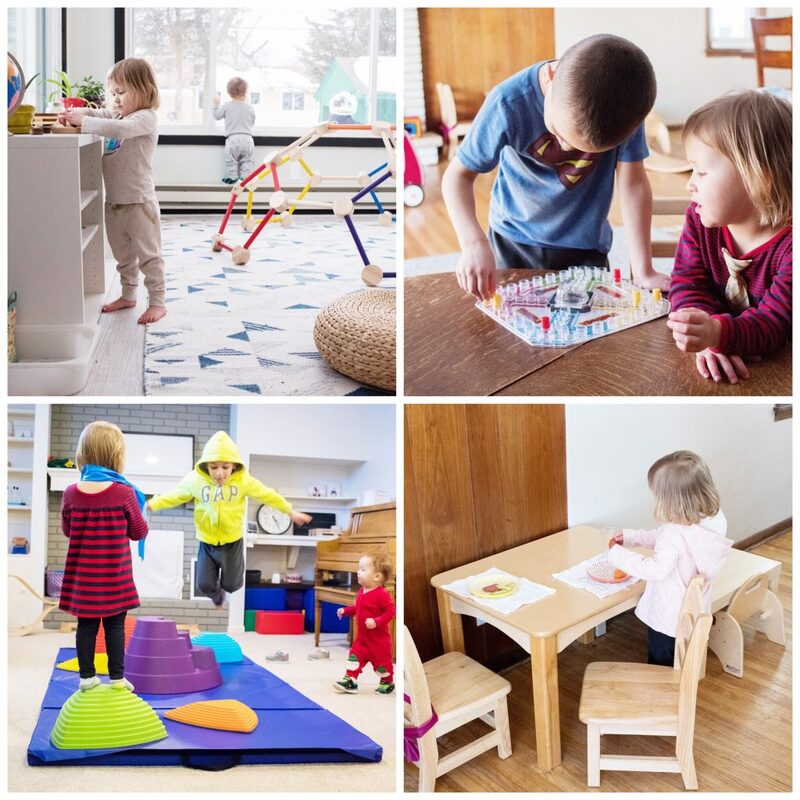 I’m a Montessori parent in Minnesota, USA. I live with my husband, Morgan, and our three children – Henry (age 7), Nora (age 3), and Augustus (15 months). 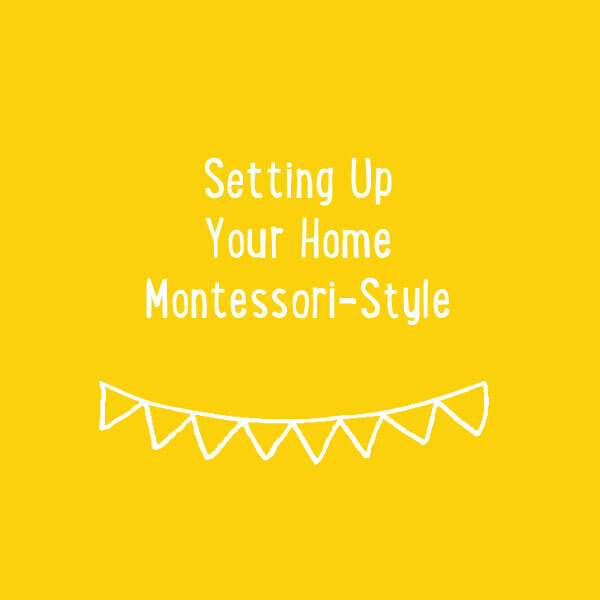 Simone has asked me to share a bit about what our Montessori home routines and rhythms are on an average day. Before, I do that, a tiny bit of back story. 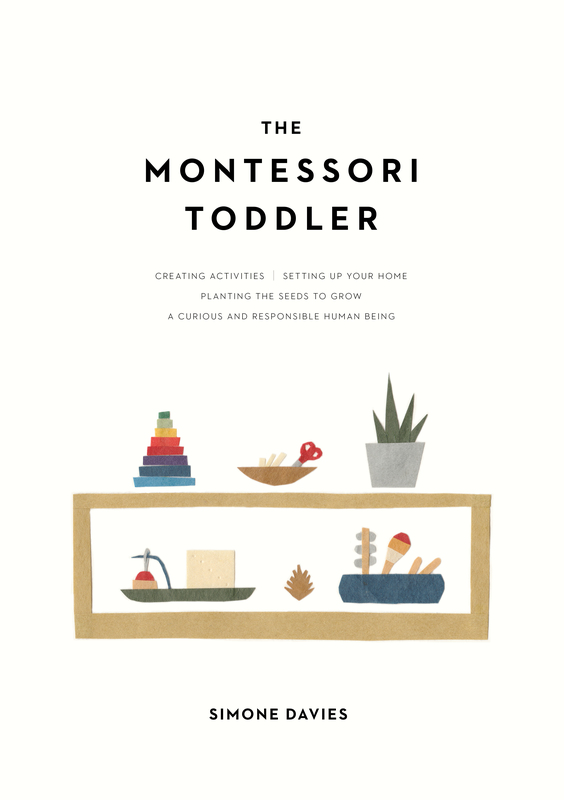 I discovered Montessori about six years ago when my son Henry was right around a year old. Since that time, we have ceaselessly started to incorporate more and more Montessori into our lives. 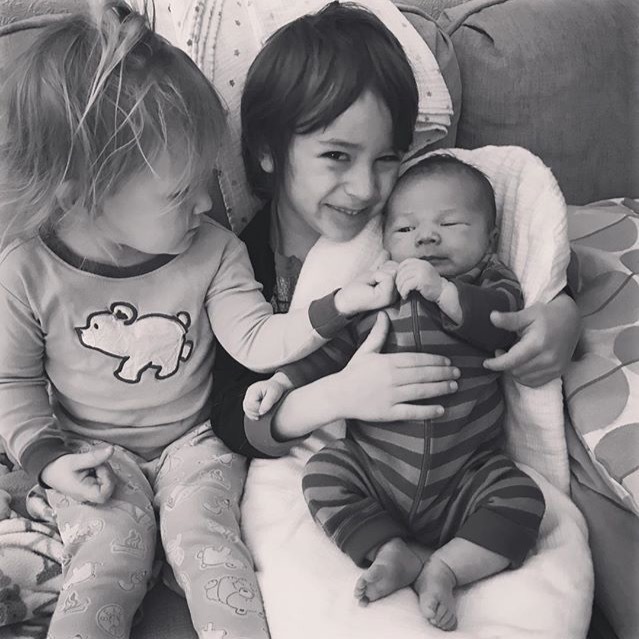 My two youngest children have been Montessori since birth, and Henry and Nora both attend Montessori schools (a lower elementary and a children’s house) outside of our home. My days almost always begin the same way – with work. At around 5:00 I get up for a couple of hours of uninterrupted work time. By working before my kids get up, I can be more present in the mornings and in the afternoons when they are home. Plus, I’m not a morning person, so I find giving myself a couple of alone hours before dealing with others makes for a better day. At around 7:00, we wake Henry and Nora to get ready for school. We keep breakfast simple at our home, because as it turns out not being a morning person is a hereditary trait and things can get unpleasant when we add too much to our mornings. The kids always have the option of making their own food, or grabbing some fruit from their refrigerator, but most often, my husband and I choose a few things and they serve themselves family style. For a little bit of connection before school, I read during breakfast. Usually just a few picture books or poetry. Just whatever calls to us. Once breakfast is over, the mad-dash to get out of the house begins. I’m sure this is a familiar scene for anyone that has to get out of the house with children. This is where our prepared environment really comes in handy. The children are able to independently dress, find their things and get out the door. By a little after 8:00, the older kids and Morgan are gone and Augustus, Gus, and I start our slow mornings alone. Gus usually wakes up sometime after the big kids so by the time he leaves, he is either ready for breakfast or ready to get dressed. Depending on the day, I totally follow his lead. In fact, most mornings are just about doing what Augustus needs. We play, we read, we sing, talk, and go for walks. It’s also when I get many of my “chores” done. 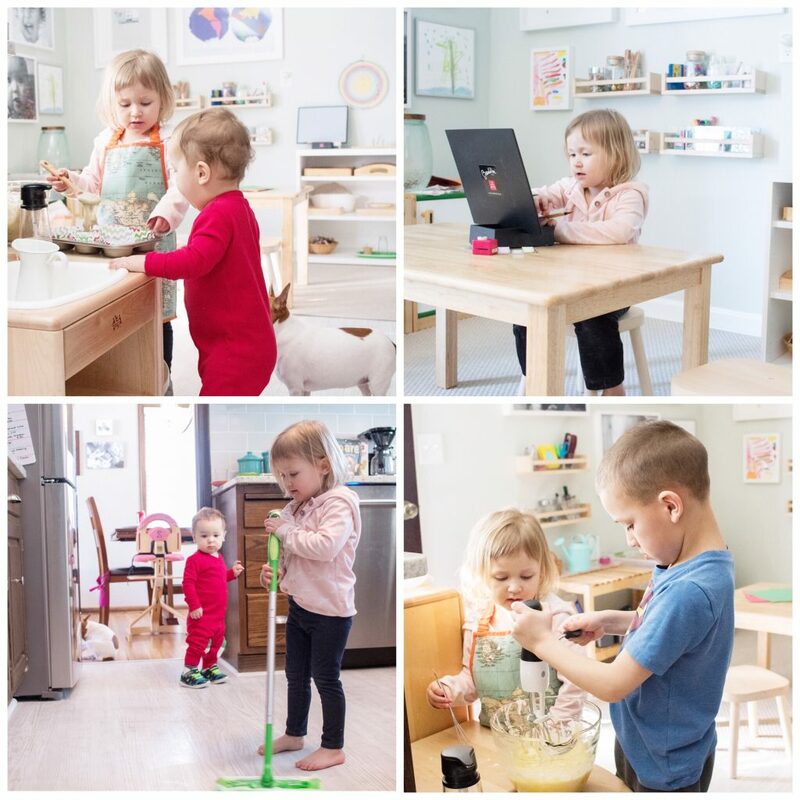 We do laundry together, run errands, clean the kitchen – you know all the things that have to get done even though you’re a Montessori home! At every turn, I invite Gus’ participation as much as he is able. If its a grocery run, we explore our purchases. If it’s dishes, he helps to put them into/out of the dishwasher. If it’s laundry, he destroys the piles. Hey, we’re working on it! But, really, it’s simple, it’s slow, it’s unstructured. Since Nora is in a half-day program, by Noon we pick her up. Lunch time marks an opportunity for Nora to work in the kitchen. She comes home and gets right to work. It usually isn’t super complicated but she has the freedom to make something for herself. By this time, Gus is usually ready for nap. He nurses, rocks for a few minutes and sleeps in his floor bed. While Gus is sleeping and Henry is still at school, Nora and I have time together. This provides another opportunity for me to follow the child. We read, play, or work. Sometimes we do things together, sometimes Nora will take the time to be alone. I really just follow her lead. She often chooses to play alone after a busy morning with others. Sometimes it’s art, sometimes it’s baking, or even just open ended play! I respect her need for space, or her need to be with me. If I have things I need to do, I invite her participation. By late afternoon, we go and get Henry from school. The kids usually come home and once again work in the kitchen. They may bake a snack or just prepare something from their fridge. But, it’s a time we all come together to gather and chat about the day. We may read, or they may just hurry outside. If you haven’t sensed a theme to our days yet, I’ll let you in on the secret – they are slow! We don’t pack a bunch of things into our days. The afternoons are a bit busier with the occasional play date, sport, or appointment. Yes, they can choose to work on some of the material I have out. But, they can also choose to just run around, jump, dig in the dirt, be with their friends, or read. And, as a screen free family, they have lots of time. At dinner time, I invite participation and sometimes Nora and Henry take me up on it, sometimes they don’t. This is by far the hardest part of my day. Everyone is hungry, tired, and ready for rest. Tensions can rise and we all try to remain calm. Usually working on a task together is a good way to ground us together for dinner. Dinner is a time when we all eat together. Following dinner, my husband takes over getting Nora and Gus ready for bed while I spend a few minutes working with Henry. While he doesn’t have homework, he does enjoy a few minutes of more focused work. It’s completely led by him but might include a few minutes of handwriting practice, reading aloud, or working on math. When Nora and Gus are ready for bed, We get a big stack of books and read until everyone is showing signs of sleep. I nurse Gus and lay him down, and Morgan lays with Nora. Henry goes to get ready for bed and goes to quiet time. At quiet time, he can use any of his materials (often this means building with LEGO without the “help” of younger friends) or read, basically any quiet play he would like until he is ready to sleep. When he’s ready for bed we go and tuck him in – usually about 45-60 minuets after Nora has gone down. And that’s about it! Slow, and uneventful. In the evenings, I work or pursue my interests. And in theory there’s some self-care in there! Our days are just following the child, and their interests and passions shine! Be sure to check out Nicole’s blog, insta and courses here. So, now over to you, what are your daily rhythms in your home? And if you’d like to read more like this, pop over here to read about Meghan’s family’s rhythm – you’ll see one thing in common, living s-l-o-w.